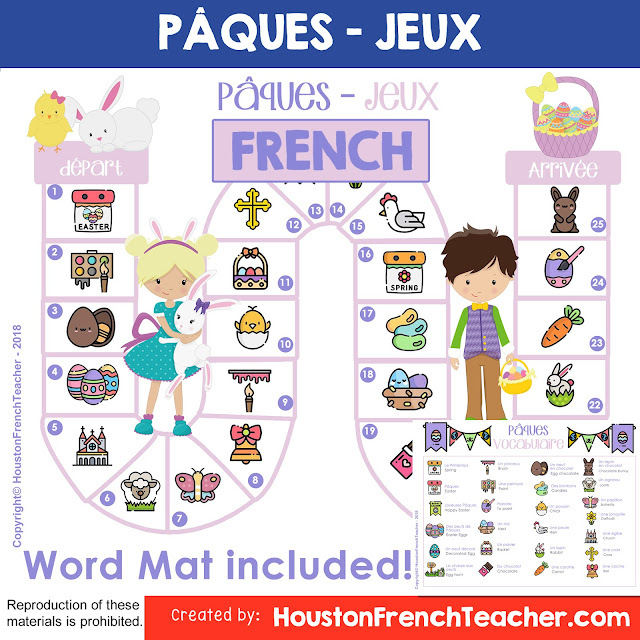 Here is the link to all PAQUES (French Easter) resources on the HoustonFrenchTeacher TPT Store. A Vocabulary Word Mat, answers sheet & foldable dices are included! Looking for a fun activity for Pâques French Easter ? This is a great way for students to learn/review the French Easter Day vocabulary. You will need game pieces (I use pencil-top erasers or different colored paper clips) and a die. Dice are included as template where you can print and make your own dice. Students can play as group of 2 up to 4 as a regular board game. Student can determine who start first by rolling the highest number. Students roll the dice and in order to advance on the board, they will need to provide the vocabulary/answer the question either verbally or in writing. They can use the answer sheet to write down their answers (practice writing). If the student does not know the answer, he/she will remain on the same spot. Students can only advance to the number rolled if they can give the answer correctly. The first student who lands on the finish box, wins the game. After few rounds of the board game, I usually do the following extensions. a) Speaking Practice with face partner or shoulder partner - students will go over all the 25 questions one by one. Student A questions student B and they take turn. b) Writing Practice as independent practice - students will answer all the questions on the answer sheet (I use the options of the printer or copier to have 2 answer sheets per page)or you can ask students to write down the answers on their notebook or use a blank paper. c) Exit Ticket - I usually pick 5-8 questions/pictures from the board and have students answer. I am a native French speaker. I enjoy combining my skills as a French teacher and graphic designer to create supplemental fun and interactive activities/games for my classes.